I have lots of different collections. Truth be told I’m definitely prone to hoarding a lot of stuff, particularly if it’s inherited, or if it’s part of a collection that I started in my 20’s. This is probably when I did most of my collecting, we lived first in London, and then various places in Devon. I would love going to junk shops, antique fairs, and car boot sales to rummage for a bargain, a hidden gem. This collection links in to my ‘Memory’ photograph, because all the items you see displayed in my hall cabinet were also all made by a pottery and porcelain company called Shelley. They are utility pieces, and by that I mean items that were meant to be used, not to be merely decorative. 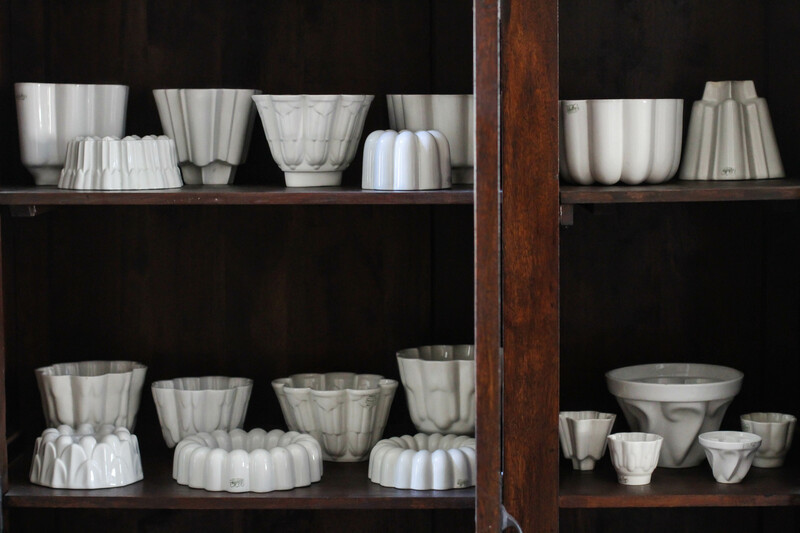 These are stoneware jelly (or jello) moulds (molds), in both individual and larger sizes. Most of them bear the standard Shelley mark from 1925-45, while a couple are earlier, one dating to 1912-1916. I think that most of them date from the 1920’s and 1930’s. They would have been used to make both savory and sweet dishes and puddings, all in beautiful shapes, as the inside of each mould is just as detailed as the outside. I took this picture at 1:30 in the afternoon, and although I opened the cabinet doors, there really wasn’t very much light. I was reluctant to put on the hall light, as it would’ve cast an orange color onto the lovely pure white jelly moulds. Therefore I set my ISO at 2500 and my shutter speed at 1/25 to let in a lot of light. I could’ve opened up my aperture wider, but instead I set it at f/3.2 to allow at least the front row of moulds to be in focus. In Lightroom 4 I increased the exposure and the contrast, then I adjusted the highlights, shadows, white clipping, and black clipping. I also used the brush to individually lighten the exposure on the jelly moulds in the back rows, as they were initially more in shadow. Finally, I increased the clarity and sharpening, and smoothed the luminance. The first thought of ‘collection’ seemed overwhelming. We as a family collect a lot, but to be honest, most of our collections are still in boxes from our move over a year ago. We are currently renting a home and thought we would only be here for about three months. Fifteen months later, we are still here. But, that is whole another story. 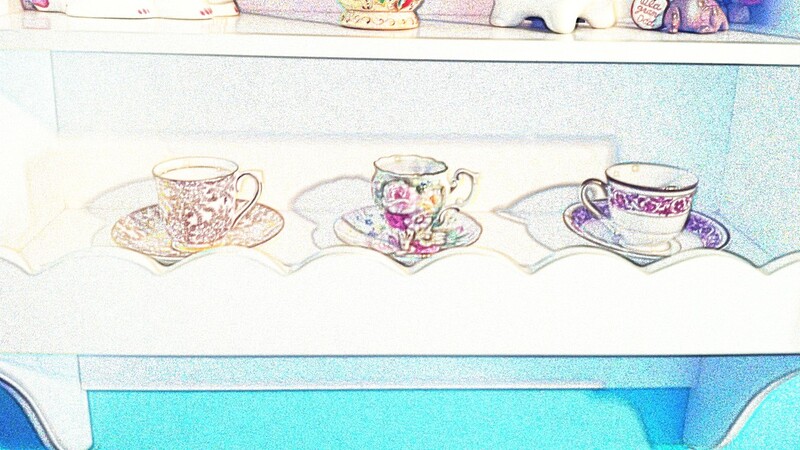 These three tea cups are just a sample of my daughter’s Tea Cup collection. Passed down to her from my Mom, they once belonged to Libby’s Great, Great Grandmother. From left to right… The first is a Cololough bone china, made in England. The middle is Jakiro, made in Japan, and the last is Yamaka China made in occupied Japan. The entire collection consists of about 30 teacups representing many countries from around the world. I took this photo at about 3:00pm while there was still some natural light flowing into the room. I cropped in snapseed and used the bright color effect in camera+. Such special pieces of collection! Lovely collections captured in two very different ways. Interesting!